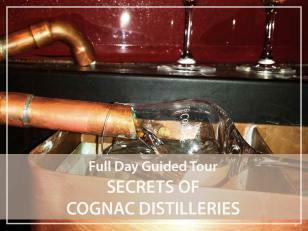 Need a guide to discover the secrets of Cognac distillation? Let's agree on a meeting point and let me guide you through the Cognac vineyard. Today it represents 9% of the total French area under vines and although most of the vines are in Charentes, it spills over onto the Charente-Maritime, a few enclaves in Gironde and Dordogne. Today, the Cognac vineyard is known worldwide! It is divided into 6 CRUS (production areas): La Grande-Champagne, Petite Champagne, les Borderies (the smallest), les Fins Bois, les Bons Bois and les Bois Ordinaires. There are more than 4,500 winegrowers who mainly cultivate the Ugni-Blanc grape variety. From this grape variety, we will make a light wine in alcohol with a nice acidity that will be distilled twice to become eau-de-vie. Come with me to discover the secrets of the Cognac distilleries : I will take you to meet one of the winegrowers working on the elaboration of this famous spirit; we will go to a "bouilleur de cru"... is a winegrower who distils his own production! Did you know that the distillation method of Cognac has never changed? This is a double distillation process using a red copper still. Come and push the door of one of the cellars dotted through the Charente countryside. Let yourself be amazed by our beautiful Romanesque churches... And don't hesitate to stroll along the banks of the river Charente between bridges and locks. You want to experience the distillation of the eaux-de-vies of Cognac, then meet in winter (between November and March). We can also arrange stops in the charming villages of the Charentais countryside or in pretty Romanesque churches that line the villages and hamlets. Each season will be an opportunity to discover Cognac's vineyards and get to know one of the region's winegrowers! With me, you can cross the roads that cross the vineyard and understand the differences in terroirs that make each Cognac vintage unique. I will help you to push the doors of several distilleries in order to understand the specificities of the soils but also the secrets of ageing in oak barrels. Do not hesitate to let me know your wishes and interests in terms of discovery or tasting and I will help you to make bookings in the distillries that match your expectations!